This post first appeared on February 21, 2019 in The Industrialist’s Dilemma. 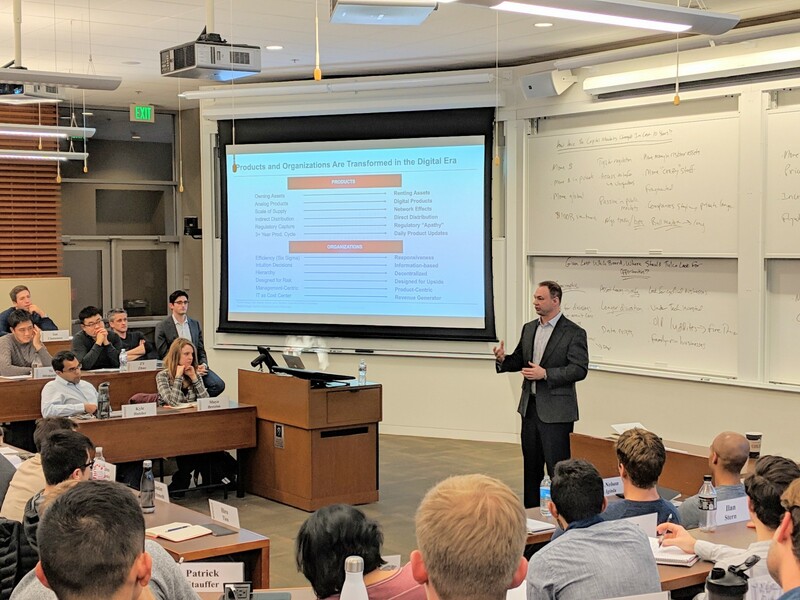 We were fortunate to have Thomas Tull come to our class for the third time in four years, but this was his first visit in his new capacity as the CEO of Tulco, his newest venture. Thomas previously was the CEO of Legendary Pictures, and our class sessions in the past revolved around how he used data and analytics to fundamentally change how movies are made and marketed around the world. After selling Legendary to Wanda in 2017 for over $3.5 billion, Thomas has focused his energy on finding industrial companies that can attain disproportionate growth by adding a combination of digital capabilities to their physical solutions where previously a digital competency did not exist. He started Tulco, moved his family back to Pittsburgh, and also set up Tulco Labs, which is a group of engineers that provide digital and technology services to companies where Tulco acquires a full or majority position. As a multi-time successful entrepreneur, Thomas sees opportunities where others do not — and his unique perspectives were what caught our attention during his visit. A clear bias that comes not only from Silicon Valley writ large, but also from some of our guests in the class, from our students, and even sometimes from the teaching team, is the notion that new technologies such as AI, ML, robotics, etc. will so completely transform existing businesses that breakthrough technology is the key enabler to building great new companies. Thomas highlighted something radically different — he pointed out that there are many good companies with strong management teams that do not have the fundamentals of digital capabilities integrated into their firms, but with these competencies, can find asymmetric growth opportunities. Whereas some companies are entirely focused on “changing the world,” Tulco sees the opportunity to grow companies and benefit from disproportionate economic returns by using technology as an enabler to solid, well-run industrial companies to reach greater levels of growth and size. For all of the discussions we have on transformation, disruption, innovation, etc. in The Industrialist’s Dilemma, Thomas presented a calm and almost down-to-earth analysis on where he sees opportunity to use capital and his operating experiences to help industrial entrepreneurs grow their companies in previously unattainable ways. Tull is not trying to build a huge portfolio of companies like a traditional venture capitalist, nor is he looking to deploy billions of dollars in large company transformation the way some private equity companies are. Rather, he sees how new digital capabilities can help companies pull away from their competition in ways that were previously not possible. The class discussion started with an analysis of how capital markets have changed over the last decade: more capital flowing into venture, private equity, etc., as money is chasing high returns due to low interest rates, companies staying private longer than in the past, and the transformation of private equity from looking at not only finding cost efficiencies to also seeking ways to grow companies and add value for the top-line, amongst other key trends. Tulco’s model definitely is in line with the latter trend, but is not “over-burdened” with managing so much capital that only a handful of opportunities exist for investment and acquisition opportunities as faced by many private equity firms. By seeking majority or complete ownership positions in companies, Tulco is putting smaller amounts of capital to work but is not playing a broad portfolio game like traditional venture capital. Tulco is focusing on an area that takes some of the more engaged/hands-on aspects of private equity, but looks at companies that might be more in the size of where venture/growth capital firms might look to invest. And, yet, this market could be huge. There are many industrial/physical businesses that to date have not reached disproportionate scale, but are well-run, profitable companies that, if they combine digital technologies with their existing industrial capabilities, can be supercharged to pull-away from the competition. Tulco’s belief is that this market is not only under-served, but that is can also yield disproportionate returns and has a huge pipeline of underserved companies. And, Tulco’s model is so fundamentally different than traditional PE or VC, that it won’t make sense for players in those spaces to compete directly unless they change their business models. One thing that struck us about Tull’s strategy was how he talked about looking for management teams that wanted to grow their businesses but did not have the backgrounds and training to use digital to transform their companies. He repeatedly said that finding leadership teams that want to double-down and accelerate is where Tulco is looking to play — not with people who want to cash out and leave. In that regard, Tulco’s strategy felt to us like a derivation of the Berkshire Hathaway or Invus model — a smaller-scale version of looking to help managers transform and grow their businesses using operational and technological know-how to achieve accelerated growth. For all of the visitors we have had over the years looking to play at a “gorilla game” level, we were enthralled with a repeat entrepreneur who sees the blend of digital and physical and has identified an opportunity for disproportionate returns in a place where others are not looking. And given Tull’s past business successes, we are inclined to think he is on to something that others are not seeing.